This resource features the general description of an ancient crypt. It includes adventure ideas that are appropriate for 7th level adventuring parties (mid-level – levels 5 to 10). Challenge Rating (CR) is calculated using a party of four as the model. When monsters are referenced, book name and page numbers are noted in parenthesis. Be aware that page numbers may vary depending on the book print. If the DM can’t find a monster where noted, it means it is a different book print. Page differences tend to be small so whatever is missing will be reasonably close to the pages noted in the adventure. Ages past, there was a powerful spellcaster who aspired to godhood. His name was Adderentha. The name is lost to time. There is practically no evidence of his existence except in the most obscure history journals. Adderentha was an egotistical man. Proud, merciless, and too full of himself. He was not without reasons to be like that, though. Adderentha was one of the most powerful human spellcasters of his time. Some well-versed scholars even argue he was the very best the human race ever produced. When Adderentha approached the end of his mortal life, he decided to take on the lichdom mantle to increase his lifespan. He removed one of his own ribs and with it created his phylactery, which he then returned to its place. Adderentha brewed the foul potion of immortality and drank it without hesitation. His living body perished instantly, withering away as his skin, tissue, and organs dissolved with an unbearable stench. What remained was Adderentha’s new form. A skeleton with a golden rib and red glowing eyes. Adderentha did not lose much time enraptured by his new form before he continued his research and work to become a lesser god. Adderentha’s goal took him on a long trip around the multiverse. The power he desired was buried all around in the form of ancient scrolls, spellbooks, and hieroglyphs in forgotten ruins in the Astral Sea. Adderentha learned that gods owe their power to a rare substance known as “divine sparks”. But the sparks were finite and in the hands of most gods. One way to get one was to slay a god, but this was out of Adderentha’s possibilities. Adderentha then came upon an old leather-bound tome in the great City of Doors. The tome’s title was “In Deus Ordo”. Adderentha found what he needed within. The book described the origins of some gods. There was a useful piece of information in Vecna’s entry. Vecna was another lich who ascended to godhood, the god of secrets. Adderentha felt a special affinity to this deity. The tome described how Vecna slew another deity millennia ago and left the corpse to float eternally in the Astral Plane. Apparently, Vecna could extract part of his power from the corpse regardless of its location. Adderentha decided he would find that corpse and find a way to steal the divine spark from it, even if such action would earn him Vecna’s enmity. It took him years to track down the godly carcass in the Astral Sea. The ancient god was nothing but an amorphous mass floating without direction. The body radiated a strong magical aura of a very distinct type. Something Adderentha had not encountered ever before. He assumed it was the divine spark’s aura. The aspiring lich devised a special ritual to remove the spark and assimilate it into his own body. He prepared the materials for the ritual carefully. Anxious to achieve his goal, Adderentha started the ritual smiling, only to discover things would not go as planned. The ritual backfired and imprisoned him in a bubble or magical energy. He could then hear a voice inside his head, loud and gritty. It was Vecna himself. Vecna laughed at him for believing he’d be able to rob a god, particularly him. Vecna revealed he had been aware of the plan for years, such was his knowledge of the universe. In vengeance, Vecna reverted Adderentha’s ritual on him and absorbed every drop of magic from the lich. In essence, Adderentha’s link to the weave of magic was severed. Adderentha found himself teleported back to the material plane, Vecna’s unnerving laugh in the background. Adderentha returned to his castle, to his followers and servants. Adderentha’s magical powers had disappeared. The frustrating experience was too much for him to handle. He knew the spells, the words, the components, but the magic would just not come. In time, most of his subjects left him when they found out he had no power left. A few stayed and plotted against him to take his treasures. They had no trouble overcoming him, he had no more power. Adderentha’s remains were eventually placed in a crypt, along with family members and a few followers who were loyal until the end. Those who destroyed him had no knowledge of his phylactery. Weeks later, Adderentha’s body reformed in his coffin in the crypt. He was shackled to it, unable to leave the coffin. The world forgot about him. Vecna, the god of knowledge, made sure the plane had no written record of the once most powerful wizard. Adderentha, defeated and bitter, swore to return to power one day and destroy Vecna. The trapped lich decided to retrain himself in the magic arts. He had all the time of the universe it to make it, it did not matter how long it took him. Five millennia later, Adderentha is still there, he still has not regained all his powers, he is still a long way off. The crippled lich is still in the crypt. He survives by consuming souls of other people buried in the crypt and by consuming the souls of creatures that sometimes come from the cave in Area 7. After 5 millennia, Adderentha is still weak from Vecna’s retribution. He only has access to spells of level 6 or lower. Additionally, after millennia in the coffin, the lich’s hipbone is fused to it and cannot escape. He can lift himself up and cast spells but is always considered restrained. The DM is free to decide the reason for the adventurer’s presence in the crypt. It could be a place they find by coincidence. Maybe the adventurers find out about Adderentha and come looking for his treasure, assuming he is dead. Perhaps the adventurers seek to confront Vecna and are looking for allies. Regardless of the reason, when the adventurers enter the crypt the encounter a party of formian warriors (see stat-block) sacking the crypt. The formians are ant-folk that live in the Underdark. A few explorers have come to the crypt before through Area 7. Adderentha has consumed their souls for sustenance. 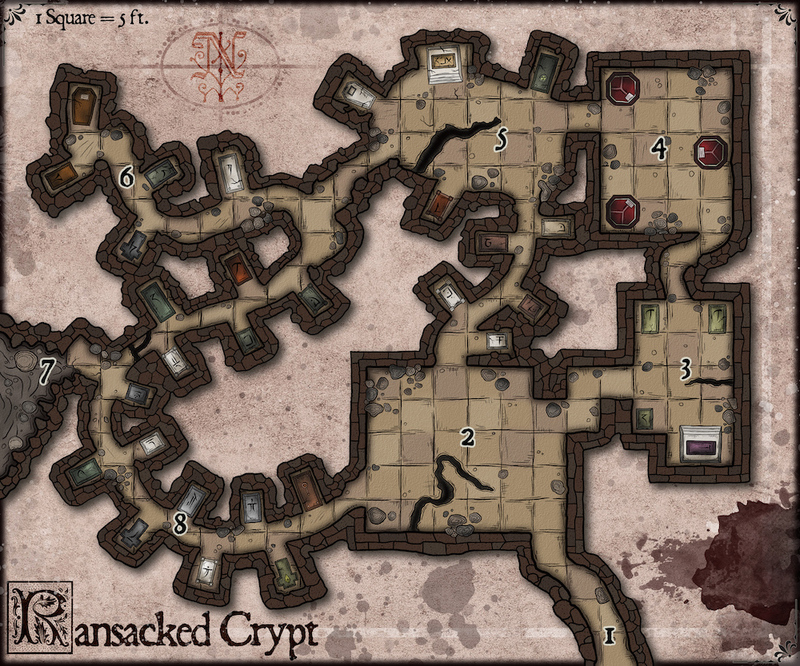 This time, however, a full party of formians attacked the crypt. They are looking for gold and treasures. Adderentha, whose coffin is in Area 5 summoned undead warriors from the other graves and coffins to defend the crypt. 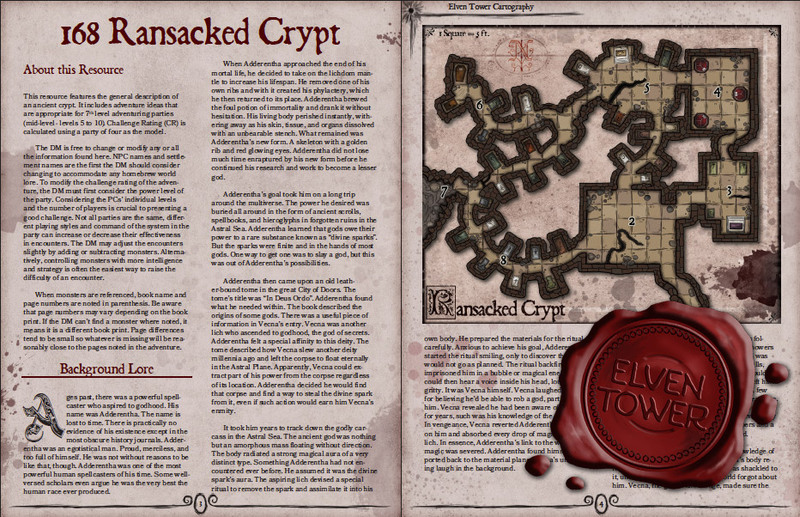 Depending on the reasons for the party to be in the crypt, the DM is free to decide who is currently winning the engagement. This is the only man-made entrance to the crypt. The crypt’s location is remote and no one ever comes. The entrance is hidden by vegetation and rocks. Once inside, the stench of everlasting dead fills the air. One the party enters this area. They see the dead bodies of four Formian Warriors on the floor. They were killed by 4 Wraiths (MM, page 302) who float menacingly above them. The Wraiths attack the party immediately. When the adventurers enter this area, if they have not been to Areas 5 and 4, a group of three Formian Warriors enters hurriedly from the northern hallway that connects to Area 4. The formians are retreating. Formians hesitate for about 5 seconds when they encounter the adventurers. Formians do not speak any language verbally. They communicate chemically with their antennae; if the party manages to use magic to communicate with the formians they will listen to what they have to say. The formians are trying to escape. If the party lets them go on their way, there is no combat encounter. If the party confront them in any way or block their exit, the formians will try to fight their way out to Area 2. There are several formian corpses piled up in the center of this chamber. Three red marble niches dominate the room. Each of them features a marble plaque with information about the person buried within. Each one of them is the resting place of Adderentha’s loyal bodyguards. The three bodyguards standing in the center of the room are Revenants (MM, page 259), they attack any intruders on sight. From this area, the adventurers can hear sounds of fighting from Area 5. Adderentha is in the golden coffin next to the north wall. He can’t move away from it but he can still cast offensive spells. The party arrives at this chamber to the growing sound of an ongoing fight. When the adventurers enter, they witness a battle in progress. Adderentha, 2 Wraiths (MM, page 302), and 2 Revenants (MM, page 259) are fighting 3 Formian Warriors. There are corpses of other formians on the floor. There are more formians stuck in the western hallway coming to aid their allies. As formians are struck down by the undead, more come to replace them. Adderentha reacts when the adventurers enter by asking for their help. He offers a sizable reward should the adventurers help. The party is free to help either side or stand idle. If they refuse to help, the DM is free to determine which faction wins the engagement. As a twist, undead or formian reinforcements can arrive from behind the party and arrack them in order to approach Area 5. There are five coffins in this wing of the crypt. Erosion has erased all clues from the stone as to whose remains were in each coffin. Centuries ago, the wall behind a coffin caved in and revealed a cave complex that continues for kilometers. The cave slants down and eventually connects to the Underdark. Many creatures have found their way to the crypt by coincidence or accident. Most were killed and absorbed by Adderentha’s phylactery. The formians came this way from their underground colony which is 5 days from the crypt. There are 14 coffins in this wing of the crypt. Some of them are open and empty. Others are still closed. None of the markings in the stone coffins are readable anymore. The DM is free to determine whether any treasure can be found inside any coffins, or if all of them were sacked previously.